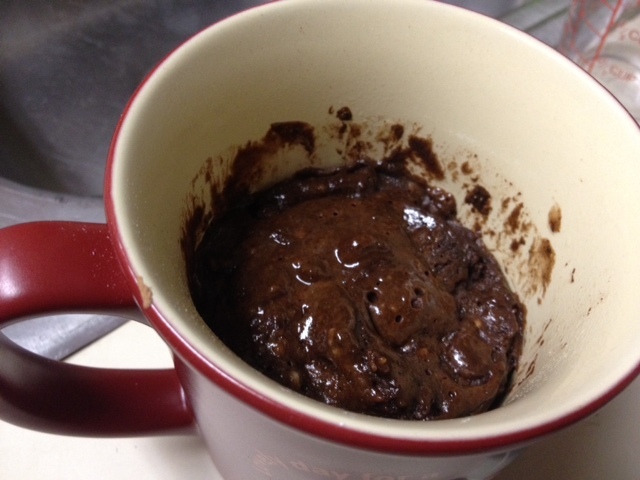 I know I did a post on mug cakes a while back, trying out a few different recipes. And I have some new ones to try too, which I’ll get to later. 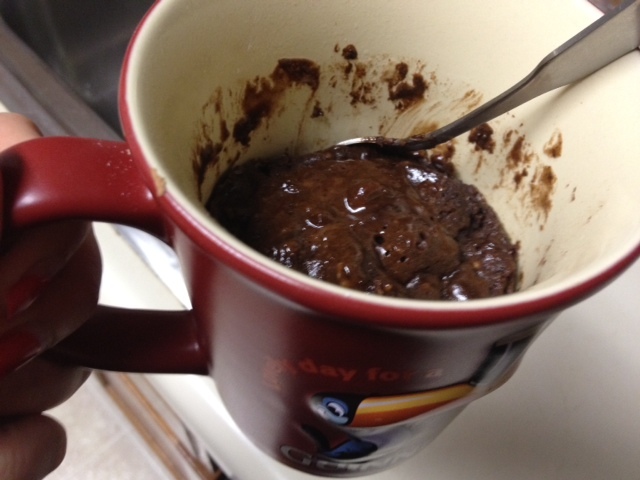 But I wanted to do a separate post on this particular lava mug cake because it is awesome. It’s the best I’ve found so far, and the thing I like most is that it doesn’t taste too sweet or rich. With the dark chocolate, it’s the perfect balance of sweet, bitter, and creamy. As I’ve established in other posts, I don’t keep desserts in my apartment, because I have an insane sweet tooth and would weigh 300 pounds. That way if I’m craving something, I either have to go somewhere and get it (which, let’s face it, I’m way too lazy to do) or make something (which takes time and energy, so I have to REALLY want it). Mug cakes fall into a dangerous area, because they only take five minutes to make, which is practically like keeping something in my pantry. But I can’t quit them. This here bad boy is my preferred Saturday night date. 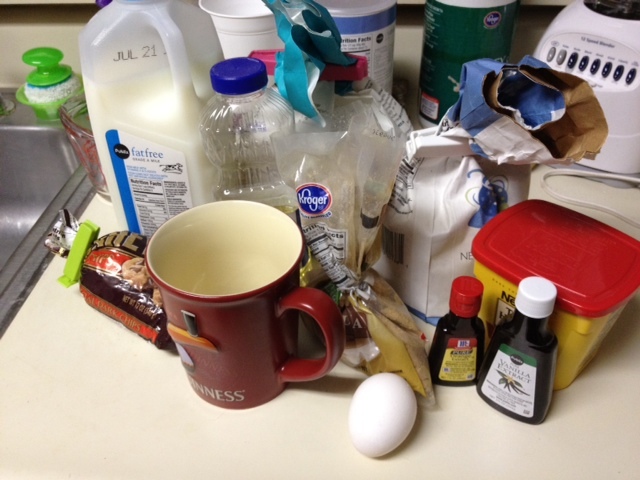 Amazing that this many different ingredients can fit into a coffee mug. 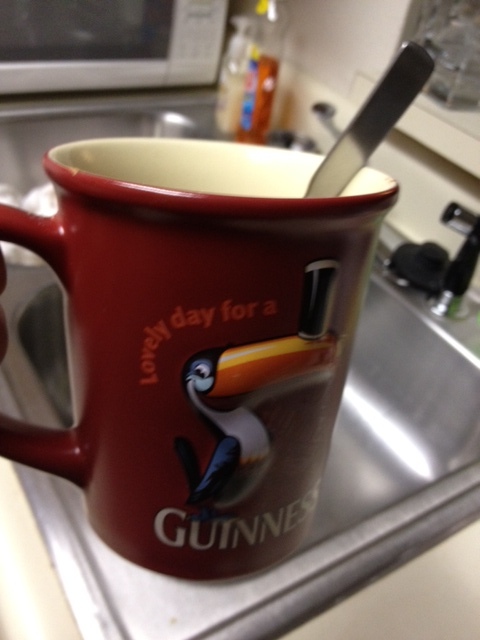 My good friend the Guinness toucan tells me it’s a lovely day for a mug cake. 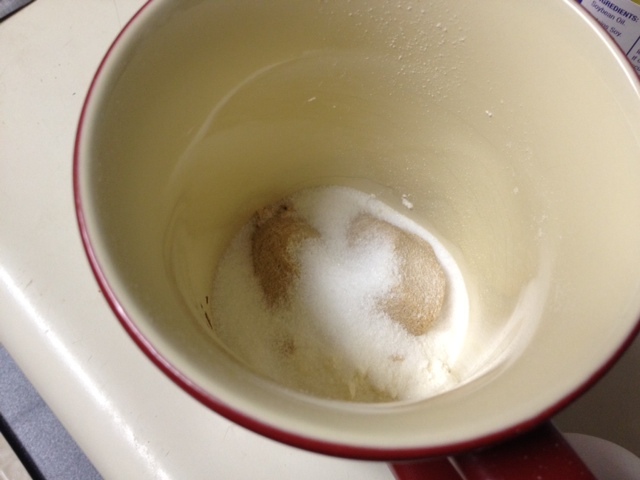 Put four tablespoons of flour, two of brown sugar, and two of white sugar (with a pinch of salt) in the mug. 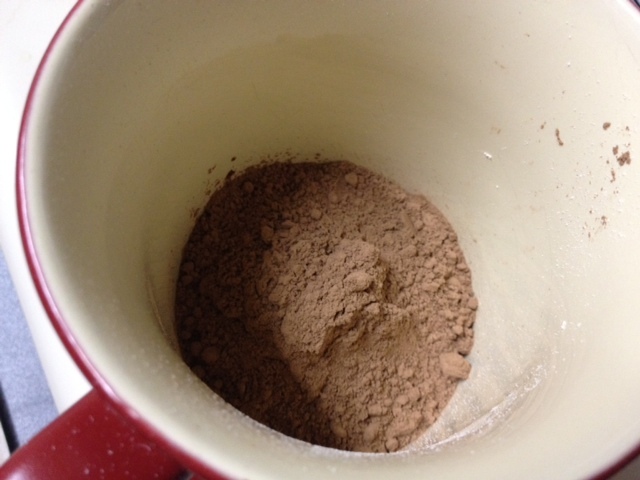 Add two heaping tablespoons of cocoa, then stir all the dry ingredients together. Add an egg, three tablespoons each of milk and oil, and a tiny bit of vanilla. If you’re adding an extract or flavoring, do that now. Stir everything together well, until you get a nice, mostly-smooth batter. Drop in the pieces of chocolate (in my case, dark chocolate chips). Don’t stir. I microwave it for 40 seconds, then give it a good stir. Microwave for another 30 seconds, then a final 10 seconds. Depending on your microwave, you may want to skip the final 10 seconds. Seriously, five minutes start to finish. I like to undercook it a little, vs. overcooking. 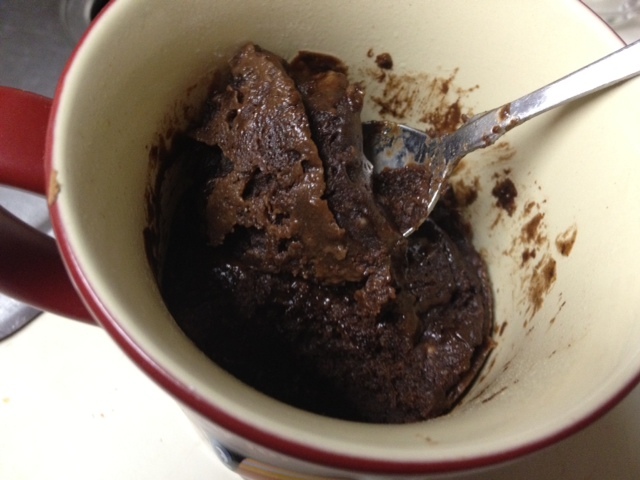 I’d rather my cake (like my brownies) be a little gooey than too dry, which is really what makes it a lava mug cake. I love the orange extract in it, but have done it without and it’s still great. Other ideas are to add some peppermint extract, a small handful of Andes mints, almond extract, peanut butter chips…the list goes on. 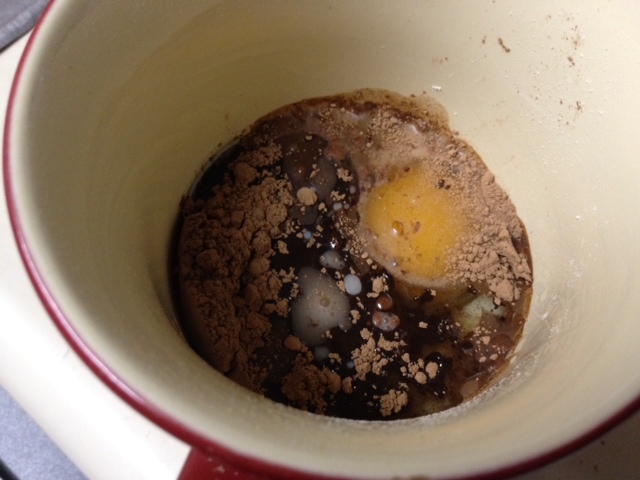 Mix together the dry ingredients, then mix in the egg, oil, milk, vanilla, orange extract, and salt. 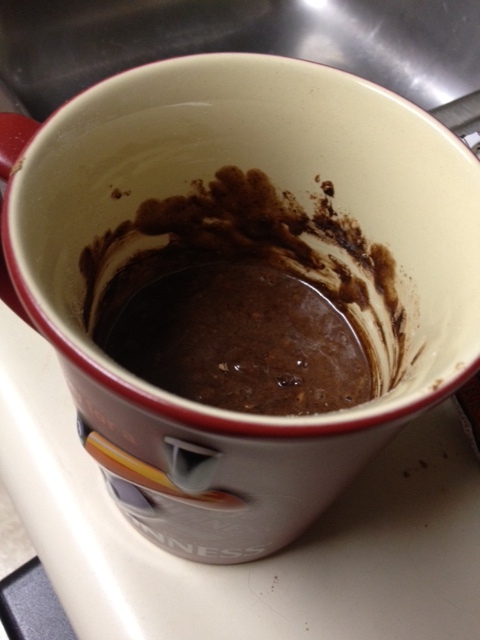 Drop about 2 ounces (a small handful) of chocolate in the middle, but don’t stir. 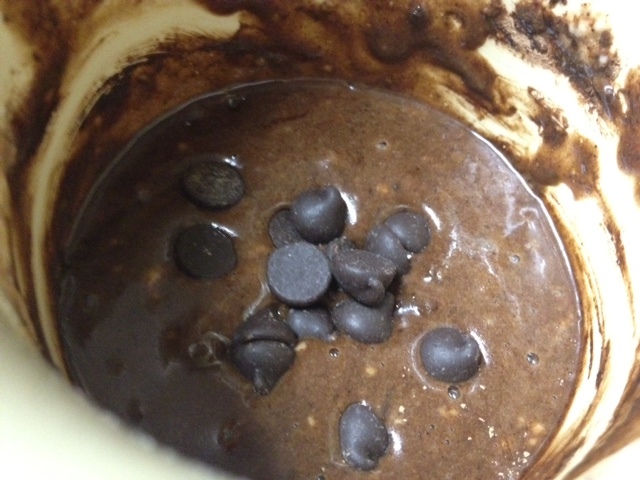 I use dark chocolate chips, like the flavor better than milk chocolate. Microwave for about 40 seconds, then give it a decent stir around the edges. Microwave for another 30, then check the sides to see if it’s the texture you want. You can give it another 10 seconds if you like.